Wildflower watchers everywhere celebrate when springtime lupines come into bloom, heralding the flowers' appearance with tours and festivals from Maine to California. Lupines are an ideal flower for beginners, requiring less than an hour of care per growing month. Their telltale look is a tall, showy spire of flowers that can come in a multitude of color varieties with impressive grayish-green textured foliage. People once believed that lupine flowers soaked up all of the nutrients from the soil, leading to its common name, derived from the Latin word for wolf. However, Lupinus plants are members of the pea family, Fabaceae, and like peas, the plants are capable of fixing nitrogen in the soil. If the growing conditions are right, lupine flowers are equally at home in the garden or on the side of the road. 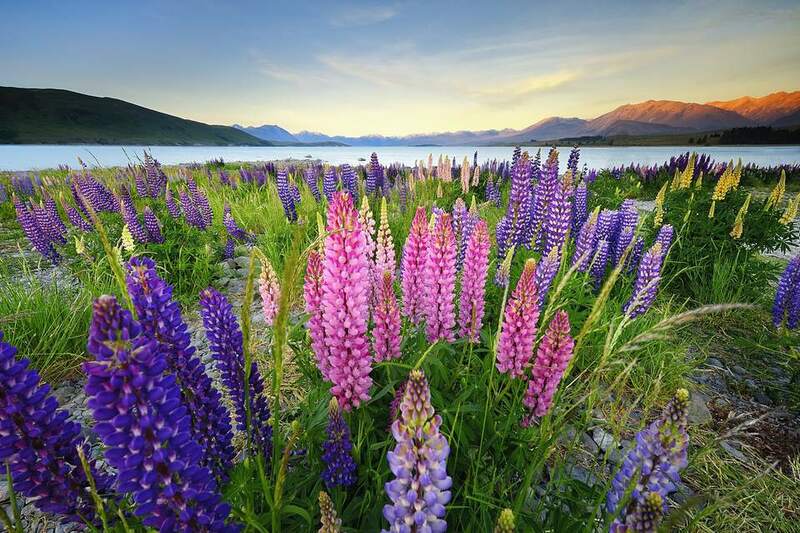 Lupines bloom over a two-month period, which can range from May to July, depending on the variety and the growing zone. Full sun is preferred. Lupine can grow in part shade, but flowering will be lessened. If you plant lupines in deep shade, they will not flower. The remedy is to trim back neighboring shrubs and trees. Lupines need neutral to slightly acidic soil, although they can grow in very acidic soil conditions. Lupines do not need rich loam, but it is important to grow the plants in very well-draining soil to avoid root rot. Sandy soil conditions and poor rocky soil promote the growth of the lupine’s deep taproot. The tall Russell lupine hybrids may benefit from staking. You can use grow-through grid stakes to avoid having to tie individual stalks to stakes. Although lupines demand good drainage, they also like regular irrigation, so provide the equivalent of one inch of rain each week if conditions are dry. Lightly mulch lupines in hot climates to keep the soil cool and moist. Perennial lupines are drought tolerant so once established rarely need extra watering. Lupines might fail to flower if there is too much sun or high temperatures, especially in early summer. Lupines prefer cool sunshine to sweltering summer sun. If you have planted lupines in a zone higher than the U.S. Department of Agriculture recommendations or in a hot spot in your garden, consider a transplant. Lupines do not require fertilizer, and in fact, too much fertilizer can encourage excess foliage growth at the expense of blooms. Starting lupines from seed is an economical way to get a showy flower garden the following season. The seed coat is tough, and seeds have a better germination rate if you nick the seed coat or soak it in water overnight. Plant it about 1/4-inch deep outdoors in a permanent area that receives full sun; it does not transplant easily due to its long tap root. Expect germination in 14 to 30 days. Lupines benefit from deadheading or removing spent blooms after flowering. This prevents unwanted volunteers from taking over the garden and may encourage some additional reblooming. By preventing lupines from developing seed heads, you also allow the plant to redirect energy into root and foliage growth, which results in increased plant vigor. The rich nectar stores of lupine blossoms make it a favorite of butterflies as well as bees. Plant them alongside other early summer butterfly favorites that thrive in similar conditions, like poppies, penstemon, or alliums. Lupines are a welcome addition to wildflower gardens and meadows, but they are also well-behaved plants that adapt to the perennial border or cottage garden. Grow enough lupines for the vase, as their stiff hollow stems keep the flower spikes erect in arrangements. Cut the flowers when about 3/4 of the flowers are open for the longest lasting arrangement. Lupines are subject to a few pests and diseases. Aphids are common in early spring, as are slugs and snails. Powdery mildew can colonize plants in the rainy season, to the point where it is best just to cut damaged foliage away and wait for regrowth. The dense floral spikes of lupines may grace your flower garden in shades of purple, pink, red, white, and yellow. The foliage resembles palm leaves, with seven to ten leaflet segments each. Although rainbow hybrid lupine seed mixes are the most popular commercially available lupine, the original blue strain is the hardiest. Over time, the blue lupines in a rainbow mix will persist and become perennials, while the less adaptable colors die out. Russell mixed colors: Bred in 1937 and naturalized in many areas, this hybrid rainbow and bicolor mixture is the foundation for all new cultivars. Lupinus polyphyllus: The species sold in wildflower mixtures consists of all blue flowers. Gallery series: Dense flower spikes on this compact plant grow no more than 2 feet tall. Dwarf Lulu: These plants grow about 2 feet tall in a rainbow of hues and feature unusually dense racemes. Minarette: This 18-inch variety looks stunning in drifts along the border's edge or in flowering containers.